A LED light strip and a profile will illuminate your worktop beautifully. 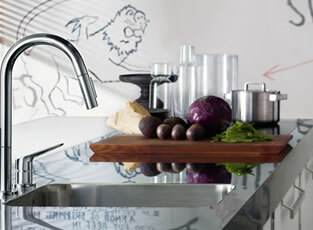 The light will only illuminate the worktop, which highlights the worktop as a stage that invites you to cook. A lighting profile can be placed above the cupboards to illuminate the ceiling surface indirectly. In the kitchen, downlights give the perfect additional lighting to the surfaces. A LED light strip and a light profile can be used to create a hanging light above your table, made to your measurements. Design lights help you to put the finishing touches to your special atmosphere.